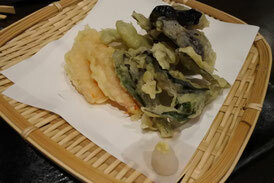 There're really awesome foods in Kanazawa city Ishikawa, I post foods that I ate in Kanazawa! The first night we had dinner at Kanazawa cuisine Izakawa Naminohana in our hotel its second floor. Izakaya is like Japanese bar, normally there are many kinds of side dishes and main dishes that go with drinks. This was awesome as well ! it's local fish sashimi plate!! soooo fresh and tasty !! actually after I got home I couldn't eat sashi from supermarket because these local sashmi was wonderful and I forgot what name of fish.... 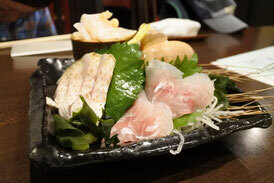 I just remember nodoguro, nodoguro is very popular fish in Kanazawa. 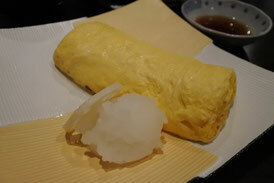 We love `` Tamagoyaki`` This's like Japanese omolet. It was really tasty tamagoyaki, its nice dashi works so much. My son wanted to try this so we had this. It's called ``jibuni``. Jibuni is one of popular local dish in Kanazawa, there are kagayasai＝kanazawa's vegitables and sliced duck meat boiled with sweet soy sauce it was nice as well. The last dish was ``Kaga-maruimo-soba`` kaga means Kanazawa, maruimo is Kanazawa yam potatos. The yam potatos knead into soba dough. The drink is sweet tasty plum sake!! I was satisfied both of them. sushi in there, local people eat that at festivals over 50 years, oshi-sushi is made using a exclusive wooden box for pressing. 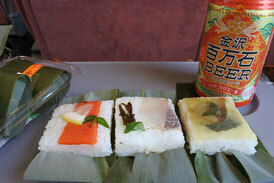 I enjoyed three sorts of sasasushi, a piece of salmon,　mackerel,sea Bream on sushi rice rapped with bamboo leaves. I could smell a little bamboo the taste is a bit different with usual sushi I think, I like it. My son ate ``Beef sukiyaki bento`` ofcause Japanese boys love beef as well !! 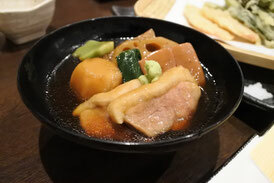 sukiyaki is beef and vegitables boiled with sweet soy souce. We bought these bentos at Shibasushi Kanazawa-hyakuban-gai. There were lots of customers're from oversea. The hotel is clean and nice also many fasilities and equipments that we needed. I lend laptop computer 1000yen. It's only 3-5min from Kanazawa station and the day we stayed there was rainny so the hotel lent umbleras to customers. you can see a little details at hotel's website ``dining``. Kanazawa foods were super tasty ! !